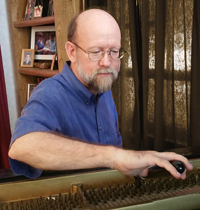 You will be assured of receiving the best possible service for your piano’s individual need. We have proudly served our community since 1980. Our goal is to provide the highest level of services to each and every client by offering complete and professional service for all types of pianos. We will do our best to provide the highest quality work available. Our purpose is to contribute to the beauty of the music you play, and to the quality and ease of your personal musical expression. Our piano tuning and repair coverage area includes the Ohio cities of Akron, Canton, Wooster and their surrounding areas, extending to Medina on the west, Ravenna on the east and parts of Cleveland to the north.